Ravi Krishna's son should be in school. He should be fighting with his brother, throwing tantrums, playing football, and annoying his parents all day long. Unfortunately, all this little boy does, is cry out in pain until it echoes through the house. He hardly eats, and he is certainly frightened of the disease that seems to be killing him slowly from within. Srithan was finishing his exams when he complained of stomach ache. We first thought it was simply a cry to get out of exams. When it continued through the holidays, we believed it was the junk food. Even the local doctor prescribed medicines for his bowels. He said it could be a stomach infection. Months went by, and my son’s pain only got worse. He begged us to take him elsewhere. 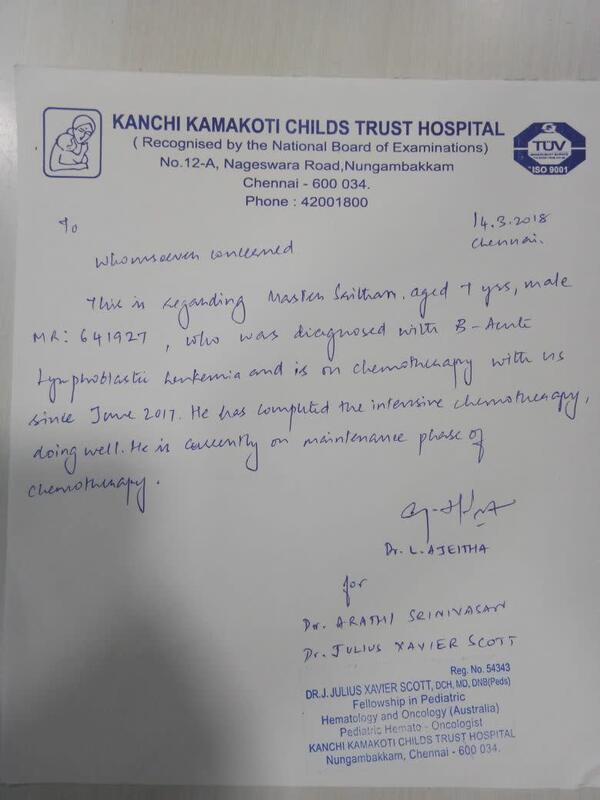 When he stopped eating, we sought an opinion at Kanchi Kamakoti hospital. 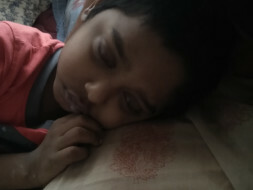 The doctor told us that his hemoglobin levels were far below normal, and lab results confirmed that Srithan had Leukemia. Srithan cannot understand what is happening to him. As his father, I do not have the courage to explain. He is extremely scared of going to the hospital. He comes because he is close to his mother and will go wherever she goes. Sudha is staying strong for him. She has not shed a single tear as she does not want to scare him, and also because nobody else knows about Srithan’s illness. We cannot send him to school. He will easily get infections. We need Rs. 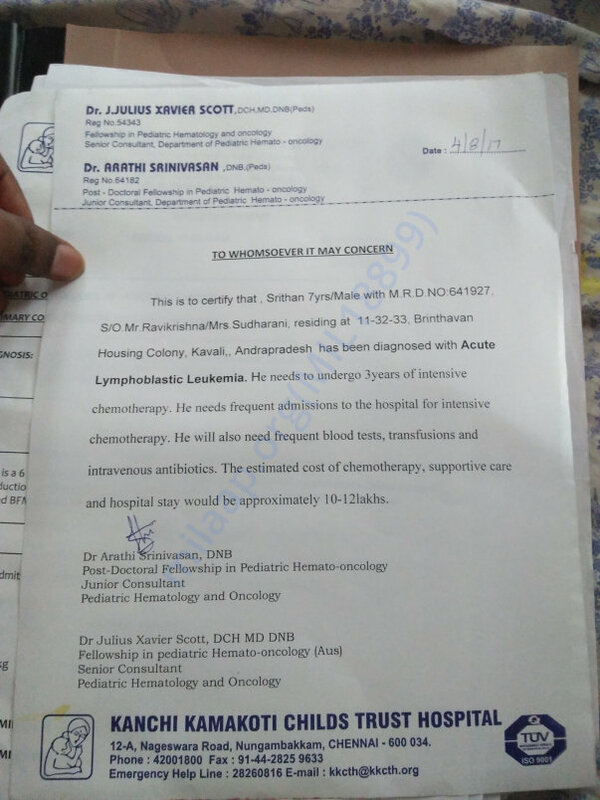 10 Lakhs so he can have chemotherapy, medicines, blood transfusions and more over the next 3 years. Where can we get so much from? If I can’t make it, then I have to let go of my son. God has put us in a terrible position. We have some exciting news to share. 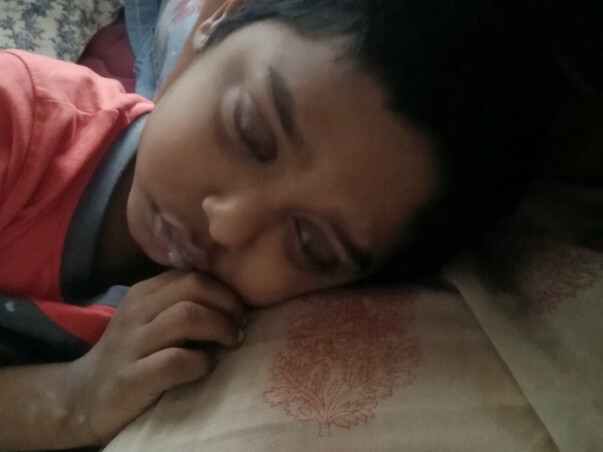 Srithan is completely doing ok, and he is comparatively feeling better now. We are finding it a little difficult to make him eat food, at times we need to forcefully feed him. Otherwise he is all fine and he started going to school regularly also. . He is on regular medication and on constant follow up with the hospital.Once in every 15 days he has to follow up with the Dr. This process has to go on for the next 2 years. We would like to thank everyone who has supported Srithan and this would not have been possible without your support and blessings. Srithan is comparatively feeling better now. He visits doctor weekly once regularly. His regular medication is going on. Yesterday we visit doctor, some Lumbar puncture test has done, results are positive and some injections have given. He started going school from last week. Thank you very much to Milaap team and every one who blessed my son. Thank you for the support that you have shown towards Srithan. He is doing better now compared to earlier. He is undergoing chemotherapy and has completed the intensive chemotherapy cycles. His response to the treatment also has been positive. Thank you all once again for all the love and support. Please do pray for his health and speedy recovery. Will keep you posted.